Pass the sushi! 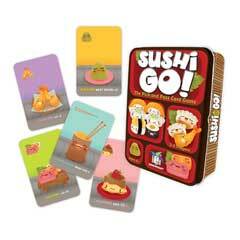 In this fast-playing card game, the goal is to grab the best combination of sushi dishes as they whiz by. Score points for making the most maki rolls or for collecting a full set of sashimi. Dip your favorite nigiri in wasabi to triple its value. But be sure to leave room for dessert or else you'll eat into your score! Gather the most points and consider yourself the sushi master!